On a gray Friday afternoon in January, I walked up the bed of the Truckee River channel in Tahoe City, CA, picking my way over rocks and icy patches; notably absent was the body of flowing water that would normally impede my path. As the Lake Tahoe Dam came into view, I could see light through one open gate, but no water appeared to be moving through, and the area below the dam was stagnant and frozen over. A green plastic chair lay broken and abandoned on the ice, adding to the grim look of the scene. Since mid-October of 2014, when the water level in Lake Tahoe dropped below its natural rim, the Truckee River below the Lake Tahoe Dam has essentially stopped flowing. Photos of the Truckee River below the Tahoe Dam, Jan 9 2015. Click to enlarge. 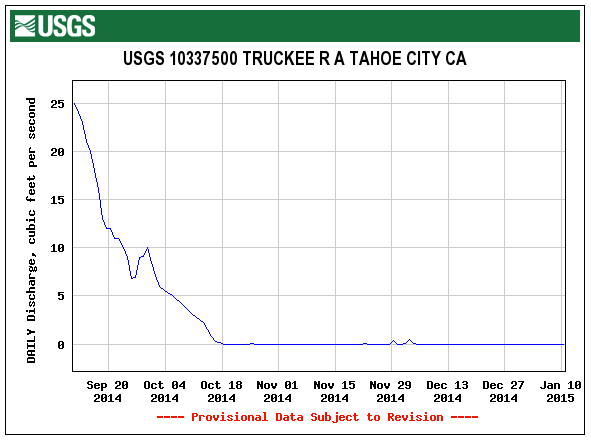 Since mid-October 2014, the Truckee River in Tahoe City CA has essentially stopped flowing. Data from USGS. Lake Tahoe, the Truckee’s source, is a natural lake with a water storage reservoir on top — and right now, the reservoir is empty. The Lake Tahoe Dam, completed in 1913, added 6.1 feet of water storage capacity to the top of the lake, so today, lake elevation normally fluctuates between 6223 feet (the lake’s natural rim) and 6229.1 feet (the upper legal limit of dam storage). This water is released as needed throughout the year, keeping the Truckee River flowing during dry times. When the water level in the lake drops below the natural rim, like it is currently, the river below the Tahoe Dam stops flowing (and to be clear, there is water stored in other reservoirs farther downstream, so the river has not stopped flowing altogether — just the upper portion). The Truckee Meadows Water Authority has a great infographic that shows Lake Tahoe’s water level in real time. 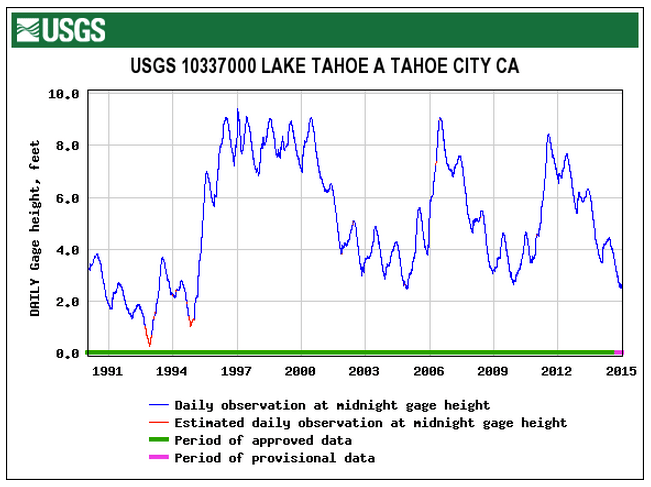 Lake Tahoe’s water level, 1985-2015. Data from USGS. What does the lack of flowing water mean for wildlife? I’m not sure, but walking back to my car, the river channel around me was busy with birds — Steller’s Jays calling from the trees overhead and a mixed flock of starlings and blackbirds hopping around on the ice and puddles. The fish, I hope, have moved to deeper pools. Further downstream, water enters the Truckee River channel from creeks and reservoirs, allowing lower reaches of the Truckee River to keep flowing even when the water in Tahoe has dropped below the rim. TMWA says that we have enough water stored in reservoirs to withstand a nine-year drought – but we’re a few years into this reserve supply now, so if you know any snow-dances, start dancing! A Steller’s Jay watches over the Truckee River below the Tahoe Dam, Jan 9 2015. Click photos to enlarge. From Fanny Bridge, looking downstream. Jan 9 2015. The Truckee River downstream from the Lake Tahoe Dam, Jan 9, 2015. From River Ranch, looking downstream: A very dry channel. Jan 9, 2015. Tremendous post here, Kelsey. Very insightful. Thank you for the information! I’ve lived in Reno my whole life and didn’t know some of this information- very interesting! Thanks Mom! It’s lots of fun!